Unless you’ve got a Roku TV or one of the latest premium sets from Samsung or Sony, there’s a good chance you need to invest in a set-top box. Unlike the software built into many “smart” TVs, a set-top box is easy to use. The software and apps are all specifically designed to be operated from the couch, the remote is typically dead simple, and the array of viewing choices are much broader than what you find built into your six-year-old 720p set. Working out the exact right set-top box for all your specific Netflix-binging needs can be a chore. So we did it for you. Every set-top box I looked at will provide the most basic set-top box needs: streaming content to your TV. Yet some boxes do the job better than others, thanks to higher quality internals, more thoughtful navigation, and better remote controls. 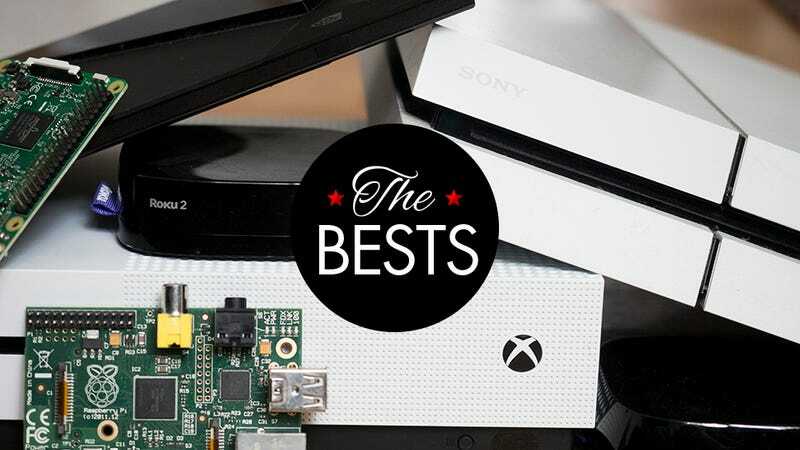 While other set-top boxes are doing double duty as gaming consoles, or very tiny PCs. To test these boxes each was plugged into a 4K TV with UHD to confirm picture quality. Remotes, if included, were used tested for ease of use and accuracy. User interfaces were evaluated for ease of use, and specs were checked, double checked, and triple checked. The number of apps available, particularly popular ones like Netflix, Amazon Prime, Hulu, and SlingTV was also considered when determining which set-top box is best. Roku was always going to top this list. It’s got a huge app store that covers virtually every app available from all the other set-top boxes combined. Need Sony Vue for watching basic cable and local broadcast? There’s an app. SlingTV for basic cable, minus local broadcasts? There’s an app. Amazon Prime? Netflix? Hulu? They’re all there. There’s also less common apps, like CBS All Access, a vital app for Star Trek fans. The Roku 4 surpasses other Roku models due to the guts crammed into it’s pancake-sized body. Android TV and Apple’s TVOS have both come a very long way, but neither can quite compare to the interface on Roku’s most powerful set-top box. It’s not as tiny as the Roku Stick, and it’s a big leap in size from the earlier Roku form factor found in the 3, but that’s because there’s a lot of power lurking in the Roku 4. It’s the first Roku capable of streaming 4K content, and one of only four boxes on the list that can do that. While nearly all 4K TV sets have some find of smart TV function, I can guarantee you that most of them won’t be as pleasant to interact with as the Roku. It just works and when you’re sitting down in front of the TV with a hot bag of takeout you don’t want to be fiddling with settings or navigating awful TV manufacturer specific menus. You want to be watching Netflix’s Daredevil in 4K. It’s also the first Roku to take advantage of AC Wi-Fi (which means it communicates with the internet faster), and it’s one of only two 4K set-top boxed with a digital audio output. That’s crucial if you want to take advantage of a high quality audio set up in your home theater. The Xbox One S is the other set-top box with digital audio output. It also does 4K. And, unlike the Roku 4, it does HDR too. Specifically HDR10. The HDR revolution is only now hitting TVs, with just a handful of sets under $1000 having the feature, so you probably don’t need the Xbox One S if you’re just looking for a good set-top box. But the Xbox One S isn’t just a set-top box. It’s two and a half times more expensive than the Roku 4 because it’s also an UltraHD Blu-Ray player. And an Xbox One. Also, unlike the original Xbox, and it’s primary console competitor, the PS4, the Xbox One S has a very prominent IR blaster on the front. So any universal remote you have can be programmed to work with it. If you’ve got the money to spare, or you’re tired of Chromecasting all your content to your fancy P-Series Vizio set, then the Xbox One S is a fantastic choice. The Nvidia Shield bears a lot of caveats. It isn’t as good for gaming as a genuine console like the PS4 or Xbox One, and Android TV, while much improved over the years, still isn’t as easy to navigate as Roku OS (it also lacks Amazon Prime). But the Shield can take advantage of the thousands of apps available on the Android Play Store, including a whole slew of gaming emulation apps. With a little cleverness on your part you can quickly be playing Super Mario Brothers or Sonic the Hedgehog like it’s 1992. You can also stream games directly from you gaming computer—provided it has an Nvidia card inside. And Nvidia’s even created a gaming service, GeForce Now, that lets you stream games to play like your friends stream a movie. The selection isn’t particularly robust—especially compared to Sony’s competing Playstation Now. But the service, and the Shield, are remarkably affordable ($8/$199) versus the Playstation ($20/$350). The benefits stack up too. Game streaming, 4K streaming, a built-in Chromecast, and more emulators than you can shake a stick at? Not a bad deal for less than $200. The Roku Stick takes up about as much space as the cheaper Chromecast, but you don’t need your laptop, tablet, or smartphone to stream content to it. You just plug the Roku Stick into your TV, connect to the local Wi-Fi, and use the dead simple Roku remote. For $50 its not a major investment but will give any 1080p set in your house an easy smart TV experience. If you’ve been using your old gaming console or a frustrating service built into your TV this is a great, relatively low-cost way to experiment with a good smart TV experience. It also works out of the box with all major universal remotes, and because it’s so tiny it’s perfect for traveling or toting to college. You can even stream from your computer, if you really need to. Do you tinker? Is Lifehacker your home away from home? Is an ideal weekend spent coding to hell and back? Then the Raspberry Pi (there are multiple versions now) might be your best bet for a set-top box. Through the magic of Kodi you can watch any of your locally stored content, and you can even hack Netflix and Amazon Prime onto the Pi. Need an IR blaster so you can use your universal remote? You can do that with the Pi. Want to stream your local content to a tablet or another computer? Then you can install Plex on the Pi. It even has one of the best emulator experiences out there—provided you’re willing to get your hands dirty. I mean, you’ve made your choice. You’ve invested tens, maybe even hundreds, of dollars into iTunes movies and TV shows. I’m not judging your wanton spending habits. Much. But unfortunately for you there is exactly one device that will let you watch all of that purchased content on your TV, and that’s an AppleTV. It’s improved a lot over the years. There are apps now. And Netflix. You can even play games if you’re some kind of masochist. But if you’re not already knee deep in Apple-only media than skip this guy and grab a Roku box instead. This guy very narrowly lost “The Best Overall” to the Roku 4. Unfortunately a lack of 4K is only going to hurt the Roku 3 in the long run. The PS4 once edged past the Xbox One S, but that was before PS Vue became available on other set-top boxes. Now this guy is better left to doing what it does best—playing Uncharted. It’s cheap. The Roku Stick is cheaper. And just as powerful. It’s not bad for $40, but the Roku Stick has better for navigation, and the Chromecast is more flexible. The only place the Fire Stick excels is in voice searching...which isn’t a good enough reason to buy it. It’s got the excellent voice search of the Fire Stick, and can output 4K, but it doesn’t have as many channels and it isn’t as easy to navigate as the Roku 4. If all you’re doingevery day, is watching YouTube videos, and press screeners, and illegal Steven Universe streams than invest $35 in the Chromecast.